Our awnings give you a range of clever options to help with shade and rain cover. Smart systems to help you get more from your outdoor area and improve your street appeal. Perfect for multi-use spaces where having the option of an open or closed canopy is useful. Popular with shop fronts, cafes, restaurants, and residential users. 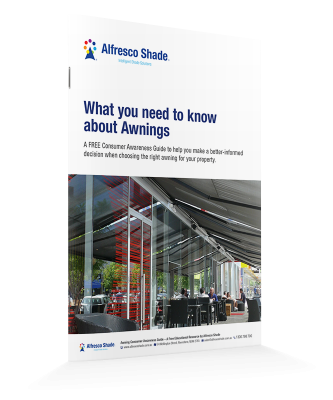 What you need to know about Awnings. A smart cost effective option when you want the flexibility of a covered or uncovered outdoor space. Experience & enjoy the luxury of the most versatile outdoor entertaining weather management system. Discover how our permanent awning systems can help boost your street appeal and encourage more visitors.